‘Gilding the lily’ is actually a misquotation of Shakespeare (look it up! ), but its popular meaning is plain enough: attempting to improve that which is already beautiful. 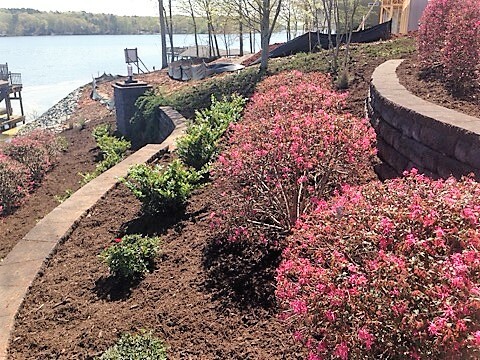 That is what our crews were asked to do for this elegant property on the Lake. We’d like to claim credit for the stonework and all the large, established Loropetalums, but these were there when our crews showed up last week. Our work entailed the installation of the new smaller plant material you see, with many cubic yards of Dark Walnut Designer mulch. 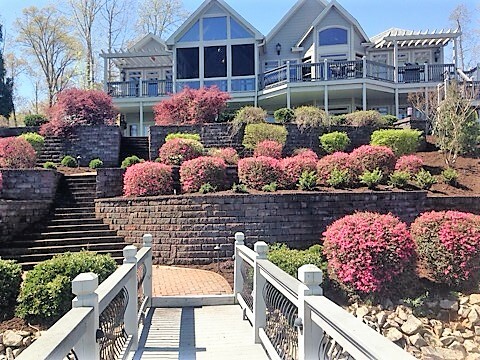 Here is a list of plants we installed: 2 Limelight Hydrangea, 6 Red Drift Roses, 18 Daruma Loropetalum, 12 Dwarf Cryptomeria, 24 Vintage Jade Distyllium, and 6 Morning Light Miscanthus. It’s hard to improve such a property, but our crew certainly succeeded in their aim to freshen up the landscape, enhance the existing yard plan with new material, and accentuate the multiple positives of this lovely property. See something you like? Contact us! Previous Post Stone Walk, Steps – and More! We are a Belgard Authorized Contractor! M-F: 8 am - 4 pm.